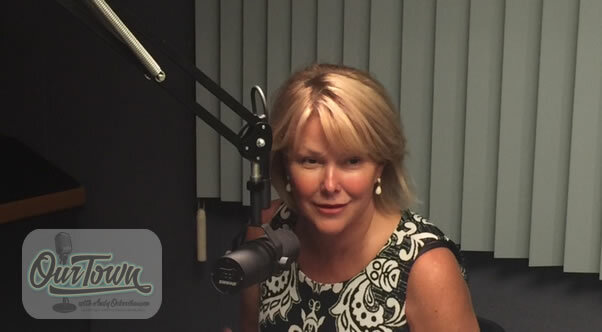 Wendy Rieger, NBC4 news anchor, is host Andy Ockershausen’s guest in this all new episode of Our Town. Wendy recalls stories and experiences during this interview that will give you good insight into who she is, and how she got to be where she is today. Andy and Wendy talk about how Wendy came to live and work in Our Town. Although not a native Washingtonian, Wendy says she “always says I feel like I’m from here because I came here when I was 22 from Norfolk Virginia. I went to school at American University . . .that’s what brought me here . . .I was finishing up my school.” Wendy goes on to tell Andy about how it was she decided togo to American University’s School of Communication. This journey included dropping out of Old Dominion in her sophomore year, and taking up acting much to her Mom’s dismay. Wendy’s interest in news started because of a job she held to make money while acting. She started doing the news on FM 99 because they needed to do news on Saturday and Sunday morning for the FCC. Wendy wasn’t a newsperson but needed the money and auditioned for the position “as an actor being a newsperson”. She got the job, did it for a year, and fell in love with news. That is what got her back into college. To this day, Wendy refers to this positive experience in her life when speaking with friends whose children are suddenly veering off course. Wendy Rieger interned at WMAL and that’s where she and Andy first met. He knew right away that she “would go places”. She went on to work at 88.5FM. There she learned a lot, and at 26 became the local host of Morning Edition. She “learned about writing and long format radio and the use of ambient sound”. She tells Andy that she listened everyday to NPR writers, who she calls “magazines writers”, and that they unknowingly mentored her. She used them as examples of what she needed to be. She names Bob Edwards and Susan Stamberg as just a couple of those she admired. She felt lucky to be in an environment she considered “fertile ground” for her new career. Wendy and Andy go on to talk about CBS and WTOP. Wendy tells Andy that WTOP was a whole different ballgame than NPR. WTOP was like the Indy 500 and NPR had a certain spa-like quality, in that it was just relaxed and much more thoughtful. WTOP was fast and furious, and she recalls the frenzy she experienced covering her first Right to Life march on Washington. She and Andy laugh as Wendy recalls wrestling with the phone booth phones and the alligator clips she had to use to file her stories. Before getting a call from WRC-TV (NBC4), Wendy spent a short time at local CNN and that’s where she got her feet wet in television. She tells Andy “that was a whole ‘nother kind of mixing bowl explosion because now you have to add video to it so you had to be concerned about your video” as well as write your story. Wendy recalls her early years at WRC-TV (Channel 4) “during the drug wars” where it was normal for there to be four people executed inside a house just every other night. Wendy recalls Pat Collins and others who were part of the hierarchy of old street reporters that you could learn from and watch. She advises students “to study your job . . .study the people around you” to learn what you need to be good at your job. She goes on to tell Andy that she did that very thing for the first four days of her Olympic coverage. Even though she has been in the business for 36 years she had never covered the Olympics so she studied and quietly watched all the sports reporters who were in her area to figure it all out. Wendy looks back when the competition was “at a wonderfully high rolling boil” and “it was about the story . . . you were in the trenches. . .” not like today it is all about ‘tweeting and social media . . . it really was meaty and you had great fistfuls of news back then. . .” Wendy was a trailblazer, and was so at a time when she had little support because the station was being sold and was running very lean. You will learn that Wendy was willing to do whatever it took to get the job done. She tells Andy of her very forward thinking Geen series that “for two years I shot my own stories . . . and NBC then adopted it and mandated it for all the owned and operated stations across the country. Andy asks Wendy Rieger about the 2016 Summer Olympic coverage in Rio. It was the first time she covered the Olympics and she had the privilege of covering local competitors. She told Andy that it turned out to be an Olympic event for those covering it as well. She said the coverage required working 15-17 hour days for the entire 20 days. Highlights for Wendy were interviews with five-time Olympic gold medalist and two-time Olympian, Katie Ledecky (the first local interview after Bob Costas) and Helen Maroulis, who was the first woman to ever win an Olympic gold medal in wrestling. Wendy says of Maroulis “she is an incredible spirit, personality”. Wendy also interviewed Ginny Thrasher from Fairfax who was the first gold medalist of the Olympics, winning the women’s 10m air rifle for the United States. One of the best parts of the any of the interviews Wendy had with the Olympians was “getting into their heads and asking them what’s in your head while you were down there”. Helen Maroulis told her that “she views wrestling as her art that she views the muscles like a puzzle and she feels like there’s different colors that she’s painting when the mat is her canvas”. Wendy Rieger says of Katie Ledecky that she “just kept saying it was easy, that was easy, and she left it all in the pool.” Andy encourages Wendy to go to Tokyo for the next Summer Olympics and Wendy laughed and said it will take her four years to get over this last one. Andy asks Wendy Rieger about her new place at City Centre downtown in Our Town and she tells him she loves everything about it – it ignites here. You can hear the energy and excitement in her voice as she describes what it’s like to live there. The two of them also talk about the quieter different lifestyle of living on the beautiful Chesapeake Bay where both Andy and Wendy have homes as well. The great thing about living on the Bay is that her brother and sister-in-law live next door and she is grateful that she has had the opportunity to see her niece grow up over the years. We hope you have enjoyed this new episode of Our Town with Andy Ockershausen and his guest Wendy Rieger. We invite you to listen to each new episode of Our Town as they roll out over the next several months. You can subscribe to the Our Town podcast on iTunes, Google Play, or if you complete the subscription form in the sidebar to the right, you will be notified by email when the next episode appears here on the website.